Perfect for households that are short of space, Miele washer dryers give you the benefits of two appliances in one. Designed to fit neatly under countertops, you can also fit a cupboard door panel to the front of these integrated washer dryers for stylish space-saving. A Which? Home Appliance Brand of the Year favourite, Miele has become a popular name in our homes thanks to its reliability and fantastic range of nifty tech. Its washer dryers are ideal for areas where space is at a premium and are packed with features that make lighter work of laundry. With drying loads of 3 to 5 kg and washing loads of 6 to 8 kg, these washer dryers are compact enough to fit into tight spaces, but big enough to cater for your family’s laundry needs. Exclusive to Miele are its QuickPower and TwinDos systems. The QuickPower programme guarantees superb washing and drying results in the speediest time possible. The combination of economical PowerWash technology and efficient condensation drying enables 4 kg of laundry to be washed and dried to perfection in just 2 hours and 45 minutes. The XL model only needs 3 hours and 15 minutes for 5 kg of laundry. Miele’s TwinDos system is its new, clever way of automatically dispensing liquid detergent. At the push of a button, it uses a 2-phase system to dispense detergent at the optimum times of the cycle for the very best wash results. Its precise dispensing can also save you up to 30% on detergent when compared to manual dispensing. For a stylish, speedy, space-saving solution to your household’s laundry needs, our Miele washer dryer range is the ideal option. 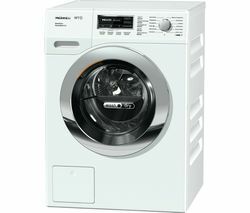 Take a look at our LG washer dryer and Bosch washer dryer ranges for a wider selection of capacities, sizes and prices.